It's tough being fashionable during a recession. A girl has to find clever ways to keep her look current and stylish without breaking her bank. Thanks to Michael Kors, girls can by their favorite tall flat boots for fall and transform them into 3 different looks (mid calf and ankle)! 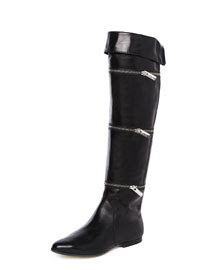 The boots are still quite an investment at $595, but will take you far with multiple styles. You can pick these babies up at Neiman Marcus. Michael Kors is really stepping it up a notch lately. I used to just glaze over his stuff with out a second thought, but he is really putting out some fashion forward shoes and accessories these days. Nice!